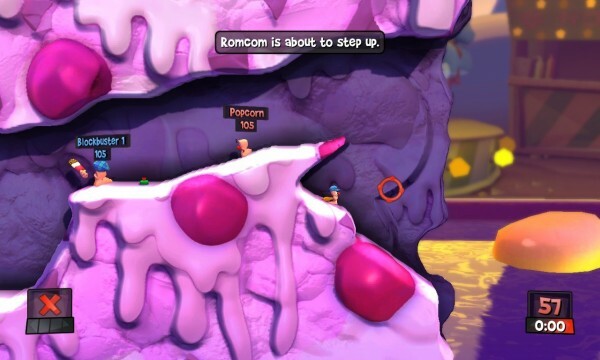 As much fun as Worms Revolution is (see our review here), this first DLC pack was released barely two weeks after the game, so that question will inevitably sour the experience. 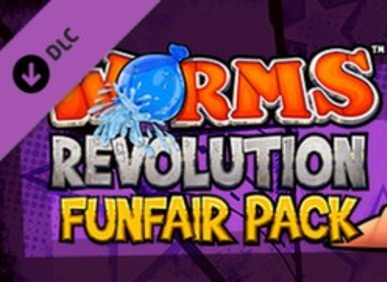 But for the sake of objectivity, let’s put that aside for now and focus on what the new Funfair pack brings to the Worm War. Perhaps the most striking thing you’ll notice is the new landscape theme.The delicious-looking pink terrain conjures memories and phantom tastes of bubblegum and fairy floss, while the 3D backgrounds are busily entertaining, positioning the battlefield as an island in one of those Fishing for Ducks sideshow games. 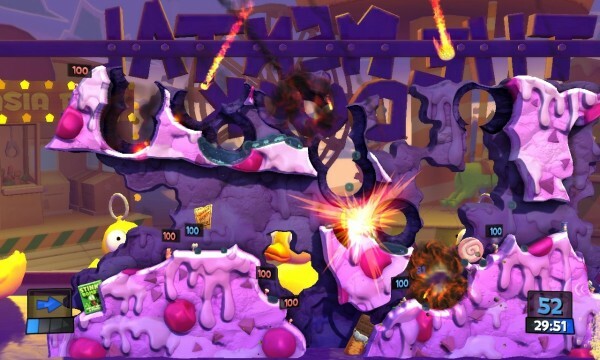 Jutting out of this sugary landscape are thematically-fitting physics objects: chocolate bars and lollipops are your basic obstacles, water pistols can flood an area with dynamic water, boxes of prank stink bombs can poison worms and firecrackers may add some bang to your attacks. A couple of extra customization options have been thrown in, as expected: your worms can now don a red clown nose or a masquerade mask, and can idly play with (pretty pointless) trinkets like a burger or an icy pole. The carnival is as much about junk food and rides as it is about people flaunting prizes and yelling at you to “step right up”, so now your worms can be that guy, with a new carny speechbank. There’s nothing exactly wrong with these additions, but again – why not just chuck them in the original game? Sorry, I’ll stop bringing that up. For now. Five new single-player puzzle levels extend the length of the game somewhat, and actually provide quite the challenge. I struggled with a couple of them: whether that’s because they employ a kind of thinking not usually required in Worms games, or I’m just bad at it, remains to be seen. They’re designed with some interesting uses of the mechanics; one mission has you moving an ally worm to a safe space, where his only mode of transport is via the end of a teammate’s baseball bat. Enjoyable as they are, they only really add an extra hour or so to the proceedings. After that, the only longer-term drawcards are the bonus weapons. Of the four exclusive weapons the Funfair pack provides, three are series staples whose exclusion from the main game is puzzling. 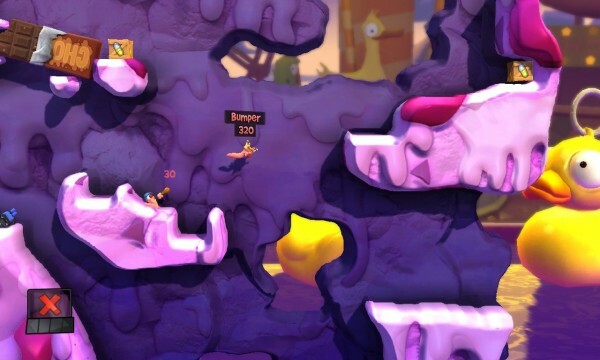 The napalm strike has made regular appearances since Worms 2 – calling down a blanket of fiery hell from above is quite an effective attack on a group of worms. Less immediately devastating but potentially powerful in the long term is the skunk. Running along like a sheep, the skunk trails a gaseous green cloud that poisons any worms downwind. It’s a tactic that’s often ignored, but poison can be an extremely effective way to wear down a group of worms over a period of time. Some people just want to watch the world burn. A powerful weapon favoured by anarchistic worms players, Armageddon summons a shower of meteorites that indiscriminately attacks friend and foe alike. It can end a game, or at least severely disrupt it. Maybe your last worm is going to die anyway and you might as well take everybody with you. Maybe you just want to surrender the balance of power to the gods of fate. Either way, Armageddon will level the playing field – both literally and figuratively. After the rain of fireballs ends, the landscape will be a far-less-populated, pock-marked shadow of its former self. Much less dramatic is the brand-new utility, the Knockout. Donning a boxing glove, your worm can sock a nearby opponent in the jaw, with enough force to make them pass out for a turn. It sounds like it could be incorporated into somebody’s sneaky strategy, but generally, it’s hard to imagine why someone who has direct contact with an enemy would use that instead of just dealing damage. These new weapons are the most substantial element of this add-on pack, but you might not always be able to use them when playing online. Obviously, having only one player with the ability to summon an apocalyptic fireball storm is a bit of an unfair advantage, so as long as the host has the Funfair pack, all players will be able to use the additional weapons during that particular match. This means you’ll have to seek out servers where the host has the DLC, or of course, host one yourself. Potentially, finding a match where you can use the DLC could be difficult, but depending on the level of uptake, the problem might solve itself. As I’ve said repeatedly, there’s nothing inherently wrong with the extra content included in the Funfair pack. Enjoyment of it however may be tarnished by its release within two weeks of the main game, and the unwavering feeling that these elements were deliberately withheld from the main game for the sake of money-grabbing DLC.